What a weekend for the Pac-12! After one last win over Oregon State in the Civil War, the Ducks have clinched the Pac-12 North title and will now face the Arizona Wildcats in the Pac-12 championship game this Friday. That’s right Ducks fans; it is the revenge game of the decade for Oregon this week. The Wildcats will look to spoil the Ducks’ dreams again — and not just in the championship game, but also eliminating their hopes of reaching the first ever College Football Playoff. Talk about pressure, right? Not for these determined and tenacious Ducks. FishDuck.com reporter Caleb Couturie was present at a post-practice press conference this morning at the Hatfield-Dowlin complex to hear what center Hroniss Grasu had to say regarding the big game this Friday and his ongoing recovery. 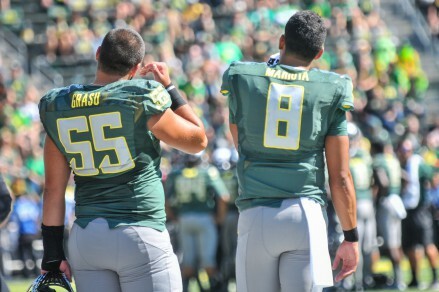 Grasu and Mariota pregame vs Wyoming. It is an exciting time as the college football season is nearing a conclusion. As a redshirt senior, Grasu unfortunately has had to sit back and watch both his senior night game and the rivalry game against the Beavers in the Civil War. “I’m just doing whatever they tell me to do,” Grasu said. “Just going in there and doing what I can do and taking it day by day. Today was a good day and I’m hoping tomorrow will be even better.” We hope for the same for the all-star center in his final games in a Ducks uniform. The Wildcats have managed to stop the Ducks’ championship run for the past two years. However, Grasu gave us an insight into how the Ducks will tackle practice this week and the preparation for a game of this high caliber. Grasu shaking hands of teammates during Civil War vs Oregon State last weekend. “They just played a very good game against us. Credit to them. What they do is not very complicated at all and they do it well. They play very well on defense and have some great players out there with a lot of talent. But, like I said, they are very well-coached. Expect a great game on Friday night,” Grasu explained. The key for the Ducks: “Just don’t try to do too much. This year’s game, the one that we lost, we just tried to do too much, especially myself … But these guys, we’ll be ready to go,” Grasu said. “We’ve done a great job ever since that game. We have grown up so much since that game, the entire team not just the offensive line. We have been really pleased in responding to that game in the way we’ve been approaching it every single day,” Grasu concluded. 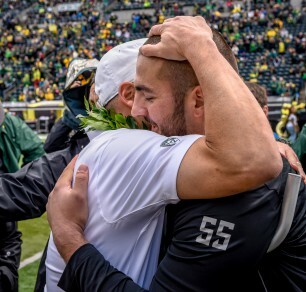 Hroniss Grasu (55) embraces head coach Helfrich on senior day.